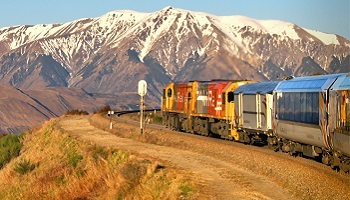 Climb aboard one of the world’s most famous train journeys, between Christchurch and Greymouth. 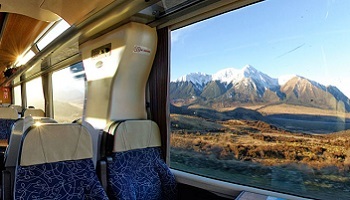 Cross the fertile farmlands of the Canterbury Plains, and enjoy thrilling vistas over deep gorges as you travel alongside the ice-fed Waimakariri River. Traverse the mighty Southern Alps, where spectacular views of the chiselled alpine landscape will take your breath away at every turn. 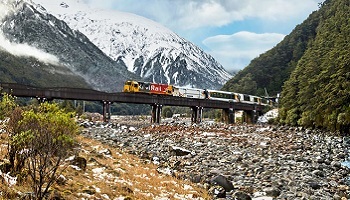 Descend through thick stands of native beech forest to your destination, Greymouth – a great base for exploring this unspoiled region with its mighty glaciers, wild rivers and famous Punakaiki pancake rocks.